When you visit the pool can be different goals. 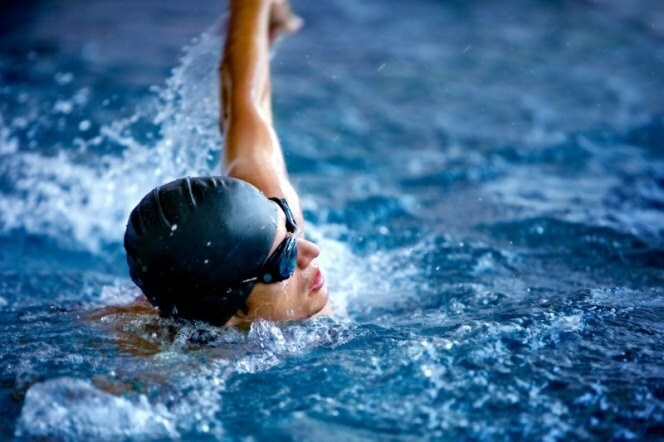 One wants to lose weight, another increase in the amount of muscle, someone who just swims for the sake of health. What the aim is, depends on nutrition. Nutrition before exercise in the pool should be matched not only caloric, but also a balanced ratio of proteins, fats and carbohydrates. Optimal calorie content of the meal is 300 kcal for men and 200 kcal for women. The volume should equal the volume of the usual Breakfast. 2-3 hours after swimming you can eat in the usual way. If the training takes place in the evening, after it you can eat, but in moderation. For example, 100 grams of nonfat cottage cheese. If the purpose of ─ losing weight, then you need aerobic exercise. In this case, to go to the pool in the morning. It is associated with the most effective fat burning after bedtime. For this exercise it is better suited to drinking a glass of fresh juice for 2-3 hours. Also in 30 minutes to drink a Cup of very strong green tea or black coffee with no additives. They will accelerate fat mobilization from fat cells. For the rest of the time training suitable meal for 2-3 hours. After a workout your body continues consumption of the accumulated fat. It is therefore not recommended, there are subsequent hour or two. For those who will not help to overcome the strong sense of hunger after swimming, you can drink 0.5 liters of kefir 1%, or to eat the big Apple. For muscle recovery foods after a workout should be rich in protein. So after 1-2 hours after exercise to eat diet protein foods. This may be: low fat cottage cheese, egg white omelet, boiled chicken fillet, boiled squid meat, white fish fillet. Intense exercise destroys muscle protein. To avoid exhaustion of the muscle fibers requires additional source of trophic muscle. You need to replenish protein for 2.5-1.5 hours before a workout and, of course, do not forget about the main source of energy – carbohydrates. Better choice products containing complex carbohydrates: wholemeal bread, porridge, vegetables or proteins (legumes, meat, milk). For the purpose of increasing strength, growth of muscles, after a workout you need to eat in the first 20 minutes. This so-called anabolic window for consumption of proteins and carbohydrates. The best are grape and cranberry juice. You can eat any carbohydrate meal containing no fat. It can be bread, jam, sugar, potatoes, rice, pasta, fruits or vegetables. You also need to boot proteins. Eating protein post-workout smoothie will increase the protein synthesis in the muscles 3 times. If you follow these simple tips on diet, the goal will necessarily be achieved.